It is now widely recognize that correct watering practices are essential for the health of bonsai. While allowing the soil to dry out will kill a bonsai, so will overwatering. As most bonsai are kept outdoors they are subject to local weather conditions and in particular, the unpredictability of rain. As it is impossible to gauge the frequency and amount of rainfall that may or may not fall on a bonsai, it is important to understand the effects of rain on the soil of a tree so that correct watering practices can be maintained. On a continual basis, overwatering can encourage root rot, poor root development and an altogether unhealthy tree. The soil should be watered thoroughly and then allowed to slowly lose moisture until the surface of the soil is nearly dry before being watering thoroughly again. Not allowing this period of time for the soil to begin to dry out, creates a perpetually wet soil that lacks oxygen, causes premature collapse of the soil structure and eventual lose of health in the root system and the tree. With these facts in mind, what effect does periods of continual rain have on the health of the roots of a bonsai growing outside? If it rains often enough over a period of a week or two, surely the soil will be unable to dry out and the bonsai will be effectively overwatered, eventually leading to health problems? Heavy rain for 2 or 3 weeks will not kill your tree (unless it already has a very weak, damaged or unhealthy rootsystem due to being overwatered (by hand) for a prolonged period of time and/or is in a very water retentive/compacted soil). 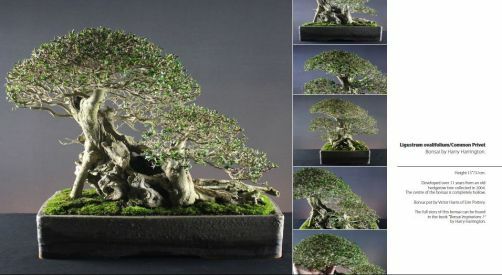 Short periods of overwatering do not damage a bonsai; it is chronic overwatering that is dangerous to the health of a vigorous tree and even then only after a period of weeks. The roots of a healthy bonsai are more than strong and vigorous enough to withstand short periods of overwatering. If continued rain doesn't allow the soil to dry out for a long period of time or the organic soil being used is failing to drain quickly enough, trees can be given shelter under other larger bonsai, landscape trees or against the side of outbuildings. Pots can also be tipped to one side to allow faster draining through one of the drain holes at the either end of the pot. Note that some bonsai pots will only have drain holes in the middle of the base; tipping these will have the reverse effect and will leave the roots sat in pools of water trapped at the base of the pot. The amount of water that is collected by the soil surface during a period of rainfall is often barely enough to penetrate the upper levels of the soil. It is a relatively small amount compared to the amount received when a hose or watering can is specifically trained on the tree. Particularly during the Summer, not watering the soil because the soil surface is wet after rain can have disastrous results if the main body of soil is still in fact dry. Unless rainfall has been particularly heavy and you are convinced that the entire soil mass is fully saturated, bonsai should still be watered after rainfall. It should always be remembered that any period where the soil is allowed to dry out would either kill or seriously damage a tree; short or intermittent periods of overwatering will not cause damage. If an inorganic soil mix (no peat/compost) is used, it is fairly difficult to overwater a bonsai at all. This is yet another reason for not using organic soil materials that breaks down more quickly through heavy rain and overwatering by hand. An inorganic bonsai soil that retains sufficient water to support the bonsai but allows immediate drainage of any excess moisture greatly reduces the possibility of overwatering. All of my trees are left outside all year round and on occasions are subject to weeks of rain, however none of them have ever suffered root rot or damage from the effects of overwatering while growing in inorganic soil.